This work put a link to the Soundwork from John Cage "Silence". I modified a LED / clock with a micro-controlled mini computer board, connected with a moving detector. Every time a person pass trough the radius, the clock counting from 4.33 backwards to 0.00. 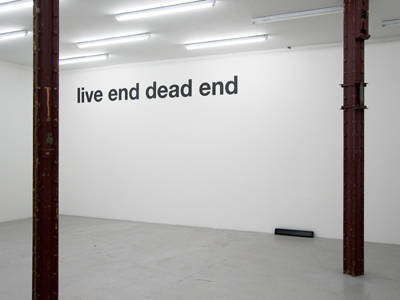 On the wall one could see the letters: "live end dead end" with a total of 4 x 0,36 meter. 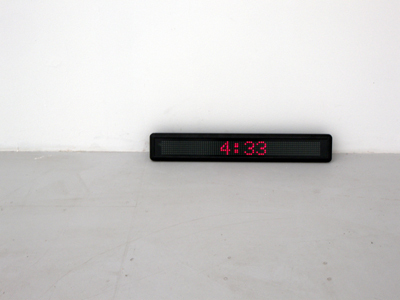 The person who move in the room are an integrated - active part of the piece 4.33. A sound installation without sound. While inside the publication of the exhibition catalog one could see a picture of an anechoic chamber, in black and white - same where cage got his idea for this piece "silence"